Introduction: This report is an account of small project that I have carried out in order to develop pedagogy resources and facilities that will enable pupils and any one else to use the NXP Rapid-IoT prototyping kit to research, lean and evaluate M2M (machine to machine) data communication between the Rapid-IoT kit, roaming robots and cloud. The NXP rapid prototyping device is a sensors’ based compact design that enables a developer to quick design, configure and test out data collecting environments. There are many options available to you. You can use the online rapid-iot-studio or you can download an Eclipse based IDE that you can run from your desktop if internet connection has been a problem. To use the online IDE, you need to register at https://rapid-iot-studio.nxp.com/. Item 3 enables you to import an existing project (from your other projects into the rapid-iot studio) use this to bring in project that you want to adapt or port to rapid-iot one. Item 4: use this option to open your previous project. Item 7 also list all your saved project. You can just click on each of your projects to have them opened inside the rapid-iot studio. Item 8: gives the option to export your project for example into other NXP projects or archived into a cloud environments. Item 6: when you click on item no 6 above you will be shown a list of examples that you can based your iot project on. To get a quick feel on how things work in rapid-iot studio and to see what directions to take and how you can quick prototype an iot based project, it is better to explore few of the examples that come ready with the rapid-iot studio. Each example comes with a brief overview of the project is for, type of project it is and area of IoT that is being explored/demonstrated.Note: some of the example projects expect you to have the docking station, the click board(s) or are tailored for that environment but you can always adapt things around. Notice that the studio tends to duplicate every open and saved projects. This show that it does not synchronise project or do incremental update. Feature or bug? Part-1: In Our first experience we built a claw-bot Vex robot and attached with it the Rapid-IoT kit. Our robot is powered by a Raspberry Pi 3 model B. It took a while before I started to understand the Rapid IoT kit and the software frameworks around it including which directions to take during my exploration of the kit. The questions that kept popping up my head are is it a tile of sensors? Can we programming this in bare-metal mode since it is an ARM based MCU?, what about SPI, I2C and Serial-communications and M2M ( machine to machine or device 2 device) communications. 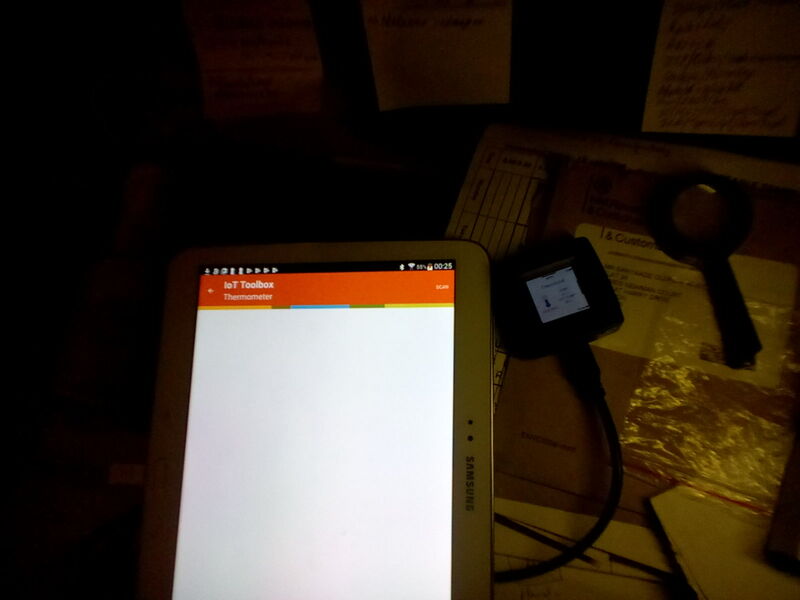 While fiddling around the gadget in order to gain insight into its inner working and internal programming mode, I did not want to brick the device. Seeing that it comes with a reset pin made to take extra precautions but I must admit that I was and being tempted to take off the plastic casing to learning more about the kit. Anyway there are two ways to go about about programming the the device. 2.) Second option is to download an Eclipse based development environment called MCUXpresso IDE. This is an offline edition of the above. This together with various Rapid IoT kit SDK, you can start to code and develop locally. MCUXpresso Config Tools - configuration tools in online and desktop editions that provide graphical user interfaces for creating system initialization software that is compatible with the MCUXpresso SDK. See below for a screenshot of the MCUXpresso IDE environment. Next the push button routines were modified to respond to changes in the environmental values like pressure, temperature, tilt-pan, etc..
Hook-up with an RC Car. I was struggling with the Escape which was removed and I focused on the raspberry Pi 3 interface instead. Suddenly somethings started to happen between the Rapid IoT sensor kit and Pi 3 receiving communication. Conclusion: Having gone through the competition tasks and Rapid-IoT kit, I think I can work better now with the kit but definitely need to use the desktop development environment and do more hacking and publication on hackster.io on this device. I do not have the docking and click boards devices but I now have the knowledge and skills to be able to work more and do some more projects on this device. I will be publishing them here on Hackster.io. Many thanks for the opportunity given and to be able to hack on this NXP device.